The journey to Broxbourne was pretty fraught. I did as they told me at West Brompton and got off at Paddington but once there, the guard told me that I should have stayed on until Edgware Road. He said that, as I had been on a Circle Line train, it would just have been a question of getting off at Edgware Road, walking from Platform 2 to Platform 1 beside it and getting on the Circle Line train to Liverpool Street. As some of the trains into Paddington are Circle and some District, I waited for two District Trains to go past (no seats on the platform!) and caught a Circle one. He was wrong. We came in on Platform 4 and Platform 1 was across the rails. I had to go up two flights of stairs, across the bridge and down two flights of stairs to Platform 1. I had only just arrived there – no-one offered to carry my case on this occasion! – when an announcement came over the loudspeakers, telling us that the train due on Platform 1 would now be coming in on Platform 3 - where I had just come from. Gnashing my teeth, I had to go back up, across and down and again, no one offered to help! I was hot and cross but at least the rest of the underground journey to Liverpool Street was quick. I went up more steps into the main line station, bought a ticket, and the journey to Broxbourne was pain free! Sally met me at the station and took me home. No sooner had we arrived than another mutual friend, Audrey McNulty, came round for tea and chats! After she had left, we just blobbed and chilled and chatted. We had so much to catch up on. The plan on the following day had been for us to drive to Ashford in Kent to visit a fellow England hockey international from the 1960s and 1970s, Barbara (and David) Harvey. Barbara has been ill for decades with rheumatoid arthritis and David wasn't well in 2017 either. There was some doubt whether they would be well enough to make the celebrations on Sunday. But Barb rang on Wednesday evening and said that the heat had completely defeated them both and she would have to cancel our visit. We were very sad but hugely relieved when they did, in fact, make it on Sunday as I'll mention later. As Sally had taken the trouble to name me on her car insurance policy, we decided that we must go somewhere and hit on the idea of driving to Felixstowe to visit Molly Gillingwater, Julie’s other godmother. We quickly rang Molly and were delighted to find that she had a free day too. It's a 2-hour drive each way and the roads were pretty busy with school holidays but we had a whale of a time. We three have always been very close friends so it was a laugh a minute. We drove to Molly’s links golf club where she, of course, knew everyone and everyone wanted to stop and talk to her. She’s obviously very well loved there. 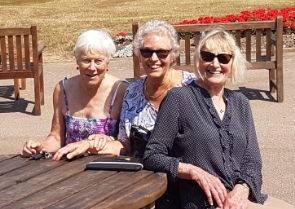 Her eldest daughter, Nicola, had been playing in the morning so we had a lovely lunch and chat together as well as meeting one of Molly's friends, Jean, with whom she'd visited us in New Zealand many years ago! As the golf course is right on the edge of the ocean, the sea breeze was delightful and we were able to sit outside and enjoy the very hot sunshine. On Saturday, Sally had a golf match and it had been arranged that I would spend the day with another close friend, and my old bridge partner in Broxbourne, Amanda. She and Sally exchanged the latest news before we left for our afternoon together and then it was all systems go! 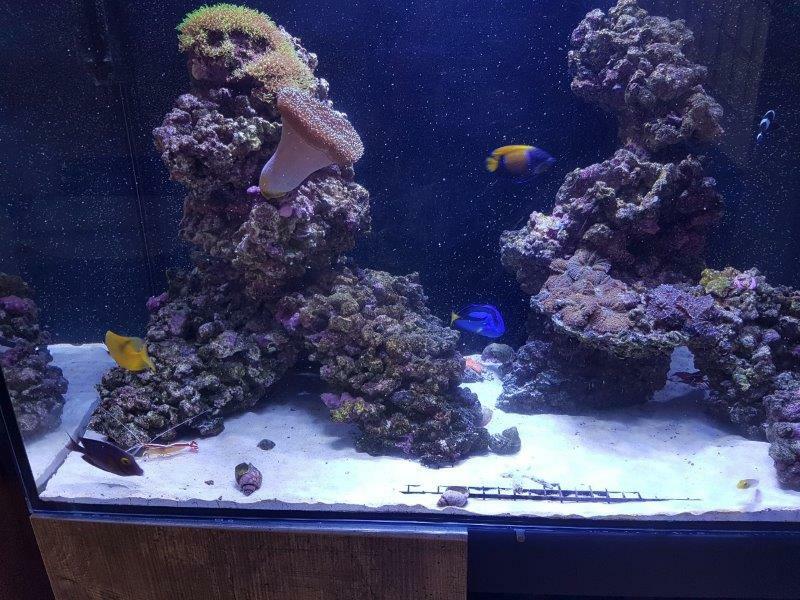 Our first port of call was to call in to Amanda's daughter, Jenny's house to feed her fish - as Jenny was away for the weekend. It was a really beautiful aquarium and I could easily have stayed there for much longer! Amanda was clearly worried all afternoon. Her mother was very ill in a nursing home and she had already visited her that morning. I hadn't realised quite how ill she was. She wanted to visit her again in the afternoon so we decided to go out for the very special afternoon tea she had planned and visit her mother afterwards on her way home. 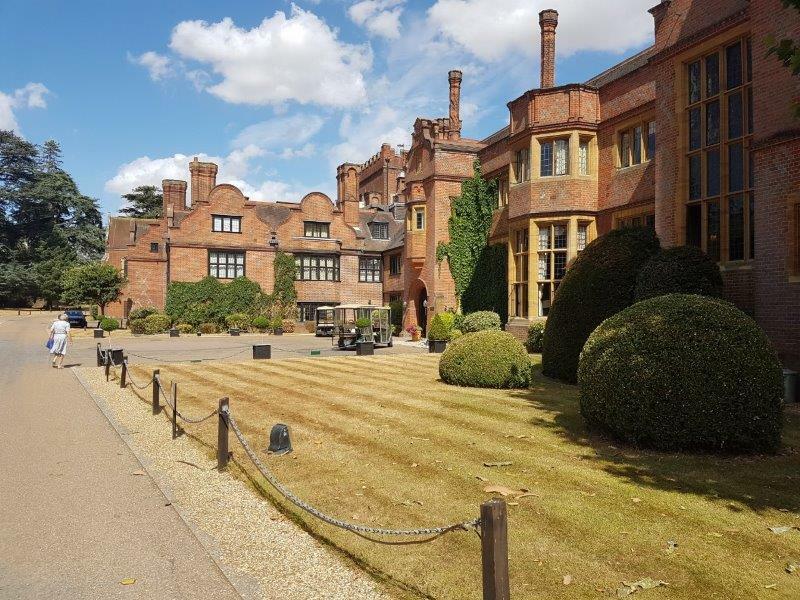 Amanda had booked a special afternoon tea for us at Hanbury Manor in the picturesque countryside near Ware in Hertfordshire. What a treat! 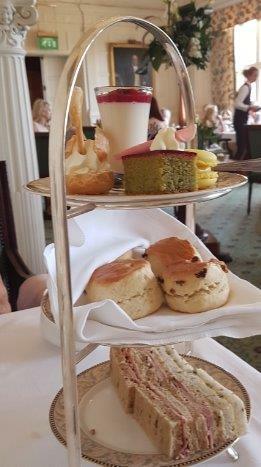 It was a beautiful, old-fashioned, environment where everyone spoke in hushed ones, the service was thoughtful and attentive and the presentation of the afternoon tea was delighful. As if this offering on our table wasn't sufficient, plates of other delicacies arrived at our elbows from time to time and were hard to resist. So much for my waistline!! But all good things must come to an end and we called at the nursing home again on our way back to Amanda's house so that she could visit her mother again. Unfortunately there was no change in her condition so she drove home and we caught up with her partner, John and had some good chats. Imagine our shock and horror a short half hour later when the telephone rang and Amanda took the call from the nursing home to say that her mother had died. Poor Amanda. Shock tinged with relief as she'd been ill for a long time. It was a very distressing end to an otherwise beautiful day. As you can imagine, sleep was hard that night but the next day was another day of partying and celebrating. The first excitement for the day was to go out to a luncheon organized by yet another very good friend of tennis days. Carol and John told me that they have a lunch party every year at about this time but they wanted to make it happen to coincide with my visit. 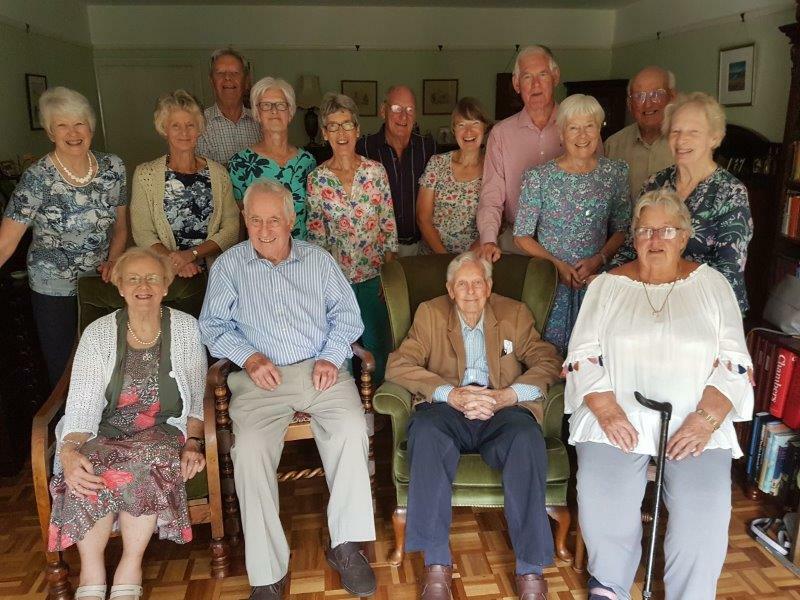 This was very kind because they invited so many of our mutual friends that it felt as if the years had rolled back and we were once again exchanging tennis, hockey and bridge war stories and remembering all the wonderful times we had had together. It was very sad when I had to leave the party - which went on until 4.30 I understand - in order to catch the train at 2.55 so that I could be at the very special event which was the main reason why I had come over to England this year. 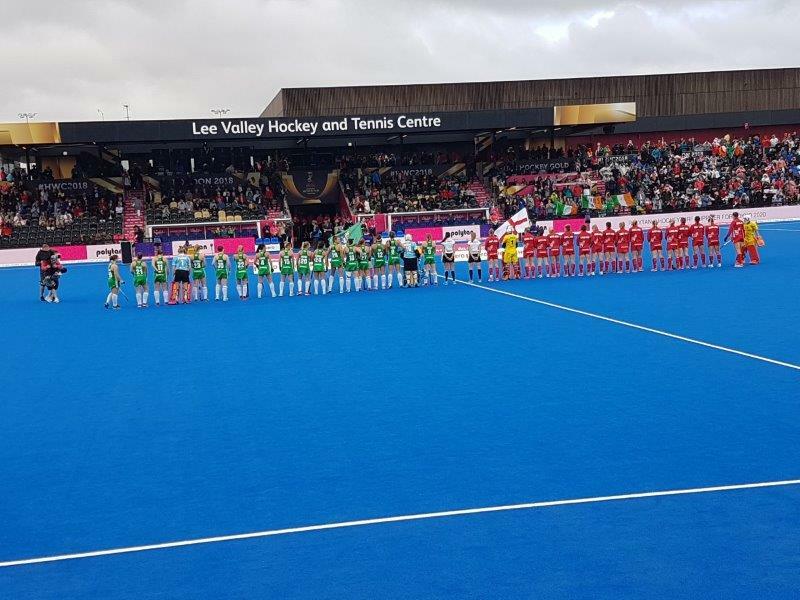 England Hockey had invited all former women hockey internationals to be part of a celebration of Women's hockey through the ages to coincide with the Vitality Hockey Women's World Cup, in London - the Pride of England. It's hard to describe what a tremendous event it was. So much thought had gone into it, and the arrangements were superb. As mentioned above, it was such a treat to see that Barb and David had made it, with their daughter, Michelle (seen here in the photo). 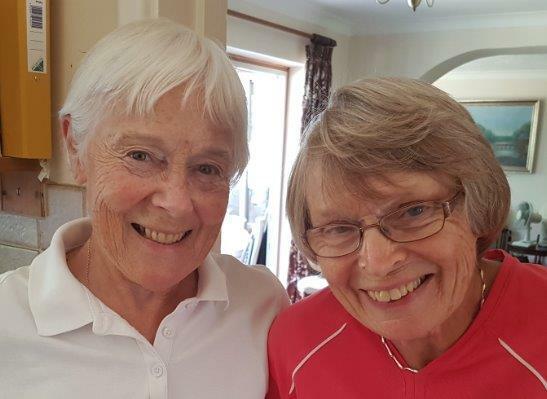 Barb and I had been part of the unbeaten team in 1965, she as a hugely talented centre-half and me at right back. We think we had something to do with keeping the opposition out of our goal! Players had made their way from all over the country (and other parts of the world) and converged on Olympic Park where a huge marquee had been set up - just for us! 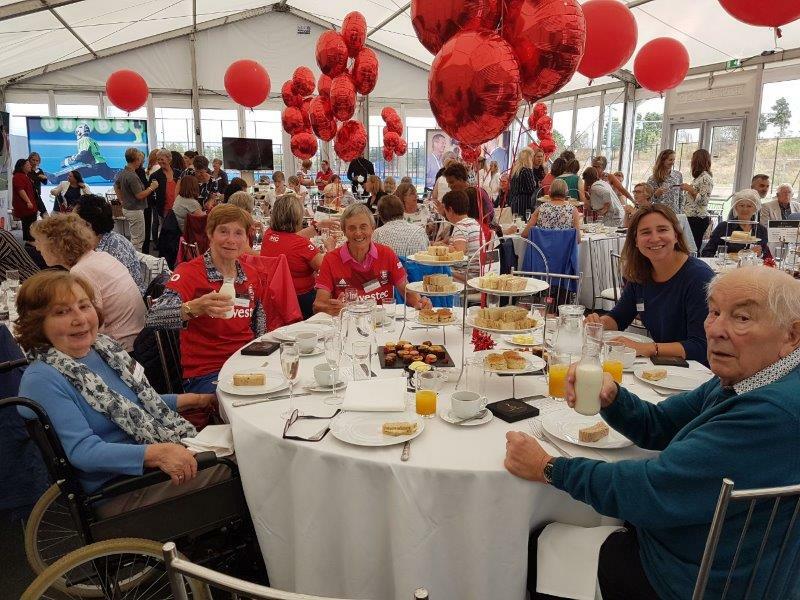 We registered, we saw people we knew, we were given some lovely gifts, including a sterling silver hockey stick charm with a tiny ball - something to treasure forever. Afternoon tea lasted for two hours and even that wasn't long enough to enable us to wander around the eighty or so players and find people we remembered from so long ago. After the tea we were all set up for a group photo before we were asked to take our reserved seats in the stadium to be ready to watch the match between England and Ireland, just lining up here for the national anthems. And the icing on the cake, England won 1-0. Phew! Making our way out of the stadium wasn’t easy and it was quite late by the time I got back to Stratford station and a train back to Broxbourne. I was so grateful that I’d had the opportunity and my mind was still full of all the wonderful conversations, memories evoked and old friendships rekindled. I was also very glad that Sally and Alan were still up so that I could relive the afternoon and regale them with everything that had taken place (they’d been watching it on the television of course) as they knew many of the people I had caught up with. And so my holiday in England came to an end. I realized that I had been spoilt rotten and, thanks to the wonderful activities that had been laid on, I'd seen many, many people whom I might not have seen otherwise. Counting up, I discovered that I’d caught up with just over sixty treasured relations and friends. What more could one ask? I set off for Singapore with a very full and thankful heart. Original generation time 1.4738 seconds. Cache Loaded in: 0.0461 seconds.